Quick Answer: The BBC's Being Human follows three “monsters”—Mitchell, a vampire, George, a werewolf, and Annie, a winsome ghost—who move into a house together. But how exactly does this motley crew get along? The answer is all in the title. As Mitchell, George and Annie deal with the challenges of being supernatural creatures, their desire to be human forges a unique bond. Though the trio’s powers and urges may differ from one another, they are linked by their shared human instinct: wanting to fit in. On paper, the British drama series Being Human (2008-2013) may seem like just another high-concept attempt to cash in on viewers’ seemingly inexorable fascination in young, attractive superhumans. For those who don’t want to choose between vampires and werewolves, Being Human offers a plot that one can really, well, sink one’s teeth into. Created by Toby Whithouse and broadcast on BBC Three, the show follows three “monsters”—Mitchell, a vampire, George, a werewolf, and Annie, a winsome ghost—who move into a house together. But how exactly does this motley crew get along? The answer is all in the title. 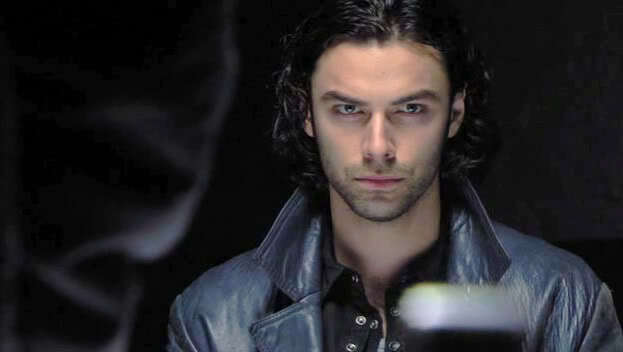 As Mitchell (Aidan Turner), George (Russell Tovey), and Annie (Lenora Crichlow) deal with the challenges of being supernatural creatures, their desire to be human forges a unique bond. Though the trio’s powers and urges may differ from one another, they are linked by their shared human instinct: wanting to fit in. At the onset of the series, we are introduced to Mitchell and George. Although there is a long history of antipathy between vampires and werewolves, the two have formed a deep friendship, the backbone of which is their mutual disgust of their infernal desires. We learn that Mitchell—who has the appearance of a twenty-something but is actually over a hundred years old—became a vampire during World War I in order to save the lives of his men. In Whithouse's universe, vampires don't need blood to survive. As a result, Mitchell is often compared to an addict, blood being his drug of choice. When the bloodlust takes over, so does his murderous disposition. But he hates his “condition” and suppresses his bloodlust. Instead, he strives to be as pure as he can be. George is the same way. He keeps his identity as a werewolf separate from the rest of his life, so much so that he always tries to transform as far away from the house as possible. He's fairly in denial about what he is, and has no interest in embracing it in any way. In this way, Mitchell and George’s friendship relies on mutual support from one another. Mitchell helps George accept what he is, and when Mitchell falls off the wagon, George is there to help him get back on. Though they are supernatural creatures, their relationship has an underlying sense of normalcy. Like any other friends, they argue, hang out, and drink beer. Even when they're fighting with each other, they never stop fighting for each other. When they move into a new house, Mitchell and George find that it is already occupied by a ghost named Annie. Like her new roommates, Annie didn’t ask for her supernatural affliction. And until they come along, she’s extremely lonely. No one can see her; she has nothing to do and no one to talk to. When Mitchell and George come along and see her (other supernaturals can see and sense other supernaturals), she feels like she's won the lottery. The new setup, however, has its entanglements. For the most part, this has little to do with the fact that they are supernatural creatures. Navigating new roommates and new relationships is, monster or not, quite difficult. At first, George more or less hates Annie, but eventually comes to love her. Mitchell and Annie, on the other hand, hit it off almost instantly. Both George and Annie have problems with Mitchell when his bloodlust kicks in, but they're willing to do whatever it takes to get him back. Despite any typical roommate flare-ups the three friends might have to endure, they are inextricably linked by their shared experiences as misfits. A vampire, a werewolf, and a ghost. According to traditional lore, these three creatures might not get along. But this friendship is not based on what they are; it's based on who they are. Being Human is less about the friendship between a vampire, a werewolf, and a ghost, and more about the friendship between Mitchell, George, and Annie. That’s what makes the show so innately human.